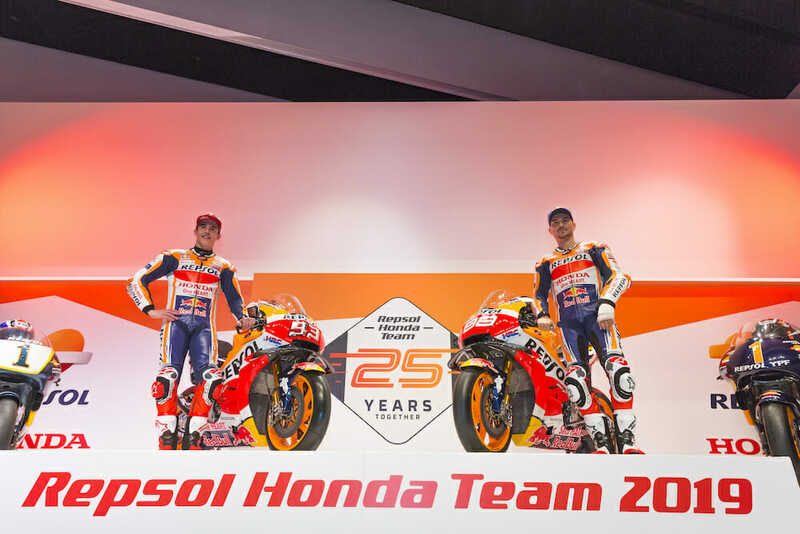 2019 Repsol Honda Team Livery Revealed In Madrid – The Repsol Honda Team celebrated its 25th anniversary at its headquarters in Madrid by introducing the team’s 2019 livery. On hand were teammates Marc Marquez and Jorge Lorenzo (cast and all), along with legends Mick Doohan and Alex Crivelle. 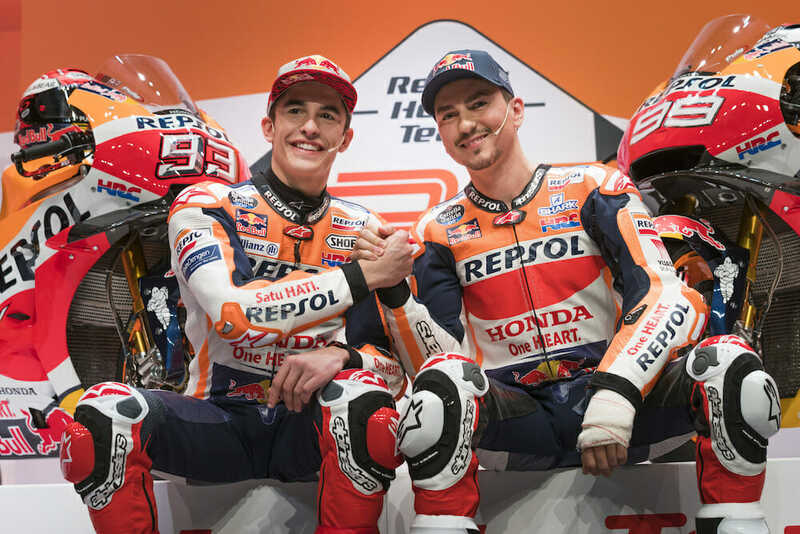 Marc Marquez (left) and Jorge Lorenzo show off 2019 Repsol Honda livery. Marquez and Lorenzo and the new Honda RC213Vs. From the Honda NSR500 of Doohan and Crivillé to the RC213V of Márquez and now Lorenzo, the HRC machines have taken 168 victories in the premier class, 14 World Championships, 427 podiums, 182 fastest laps and 177 pole positions together with Repsol, forming not only the most iconic pairing in Grand Prix racing, but also the most successful. Among these accolades, the Repsol Honda Team have also produced four dominating titles for Mick Doohan, the first Spanish 500cc World Champion in Alex Crivillé (1999) and the youngest MotoGP champion in history – Marc Márquez. Now they celebrate their 25th anniversary and aim for even more success in the future.